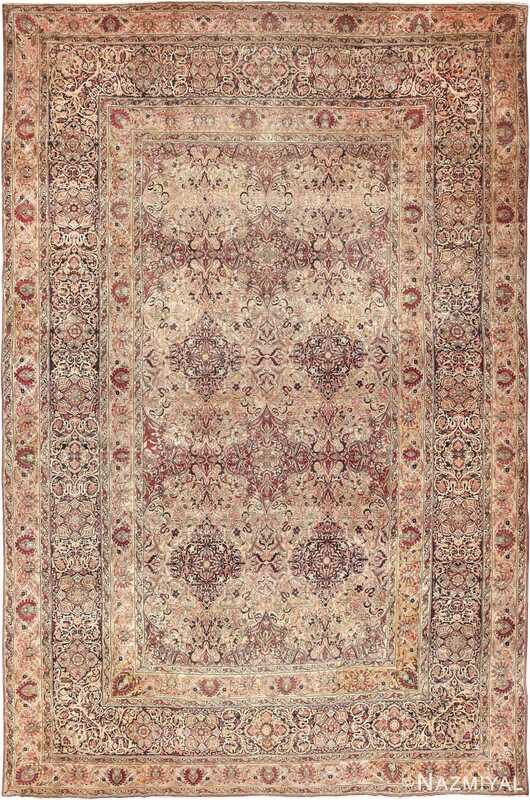 Beautiful Refined Cream and Cranberry Mauve Colored Large Floral Antique Persian Kerman Rug, Country Of Origin / Rug Type: Antique Persian rug, Circa Date: Late 19th Century – Creams, purple mauve and burgundy in this highly intricate design summon visions of Jasmine flowers with their perfume dancing on the summer breeze. This captivating antique Persian Kerman rug brings together delicate leaf and flower motifs in a formal design that gives it a sense of formal structure and scale. Its beauty will be they center of any interior decorated room that is grand enough to carry its presence. 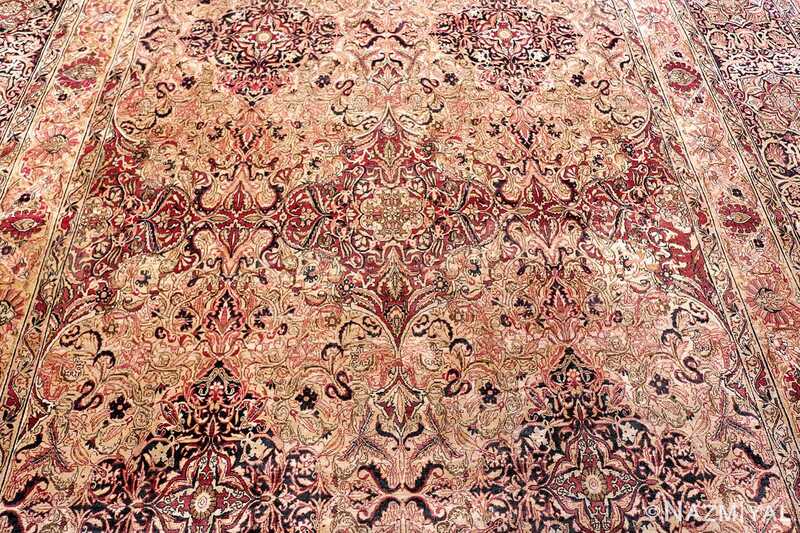 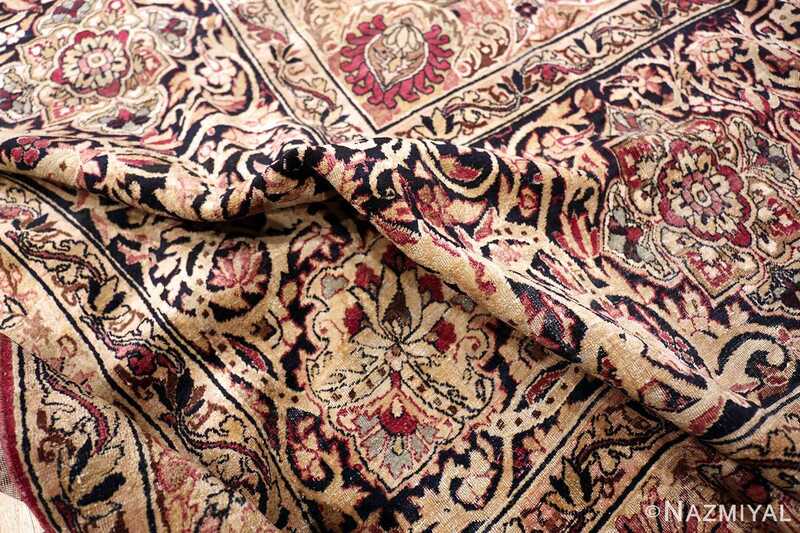 The design of this extremely fine antique Persian rug is fascinating because it appears to have a central focus. 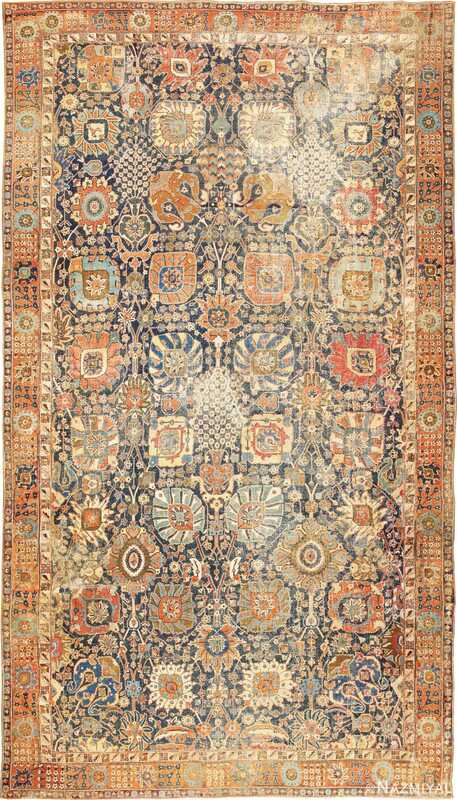 But this focal point is understated compared to the designs surrounding it which make it far more of an all over design. 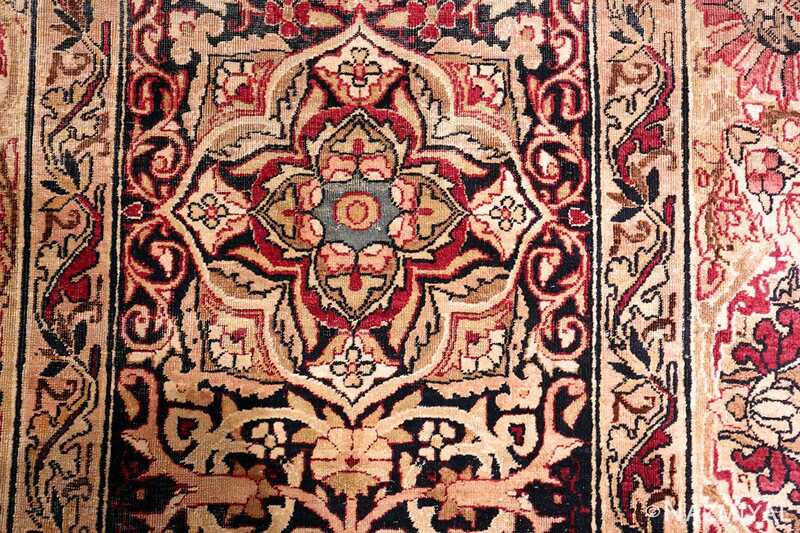 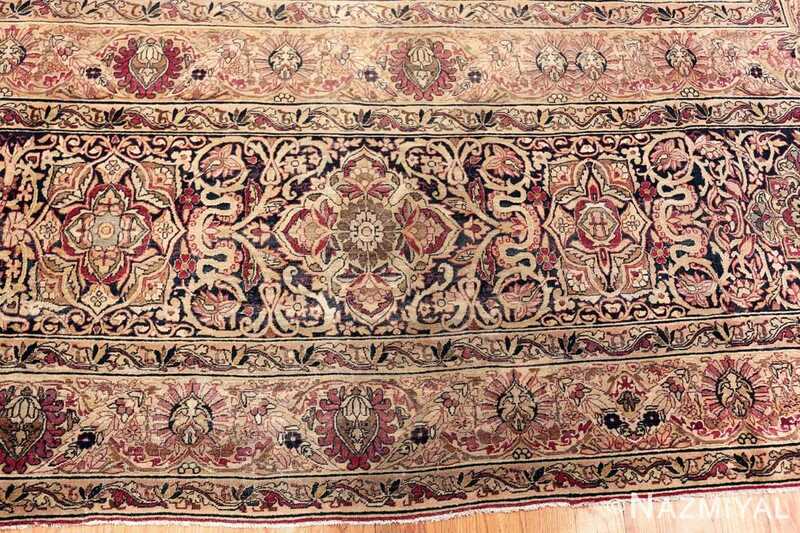 In addition, the Persian rug weaver did not give the focal point symmetrical treatment on either side of the length of the large size rug. 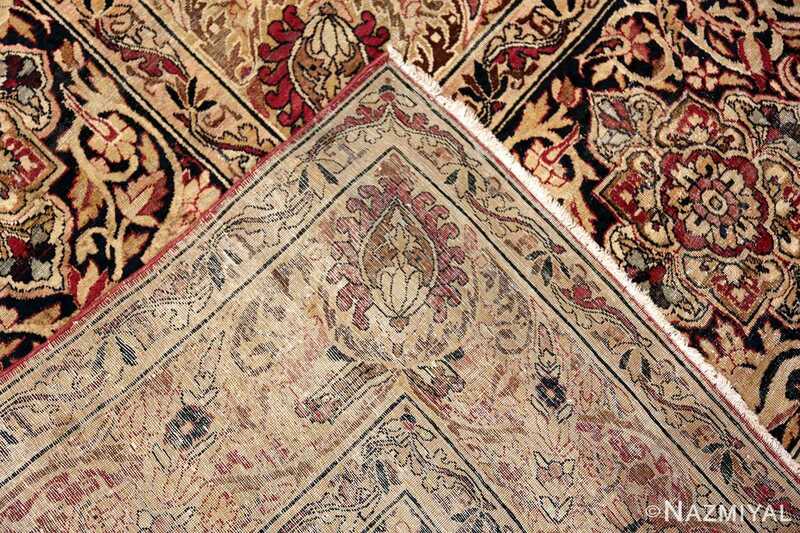 It has vertical symmetry, but not horizontal symmetry, which gives it the appearance of length. 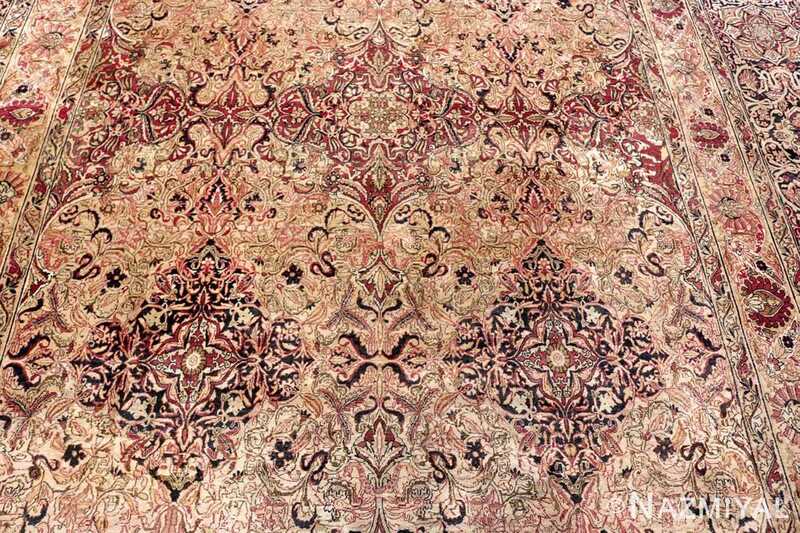 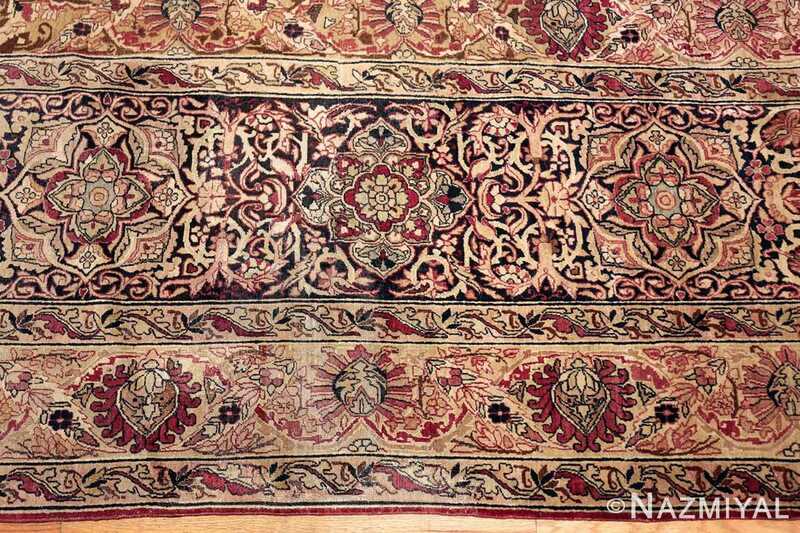 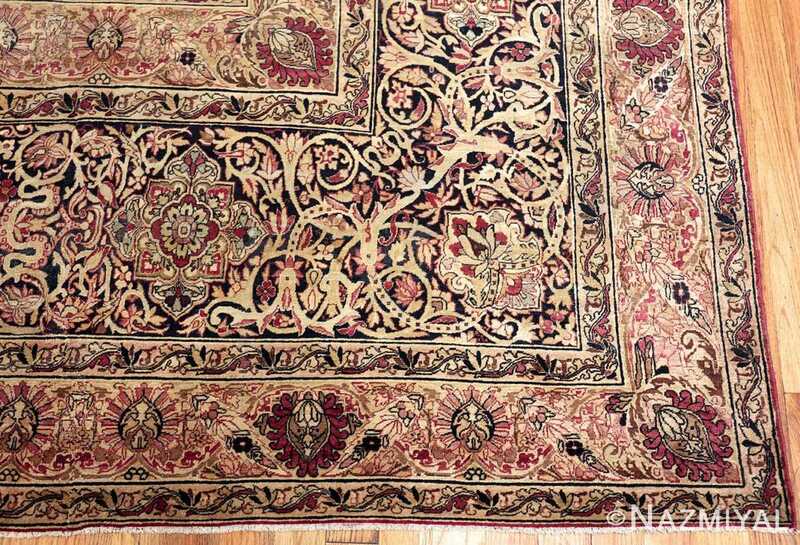 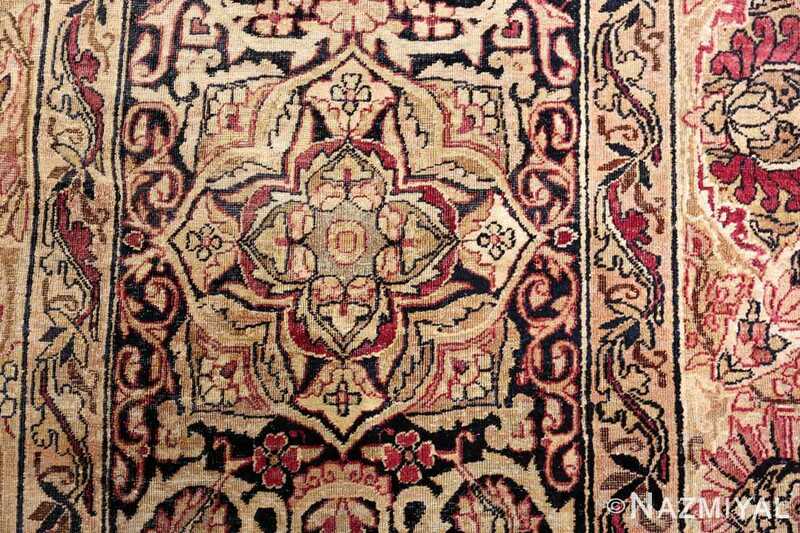 Another interesting feature of the antique rug is that multiple formal borders are given as much attention as the central field of the large floral antique Persian Kerman rug. 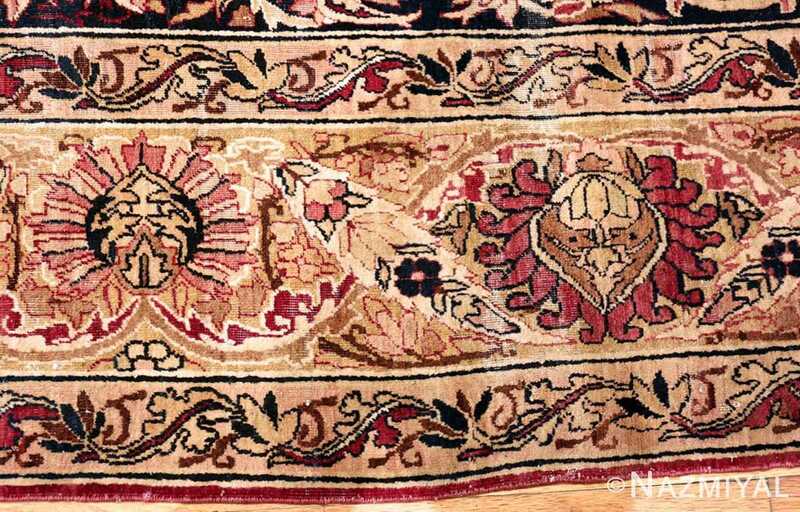 This highlights the overall geometric structure of the floral design of this rug and the placement of the smaller rug patterns. 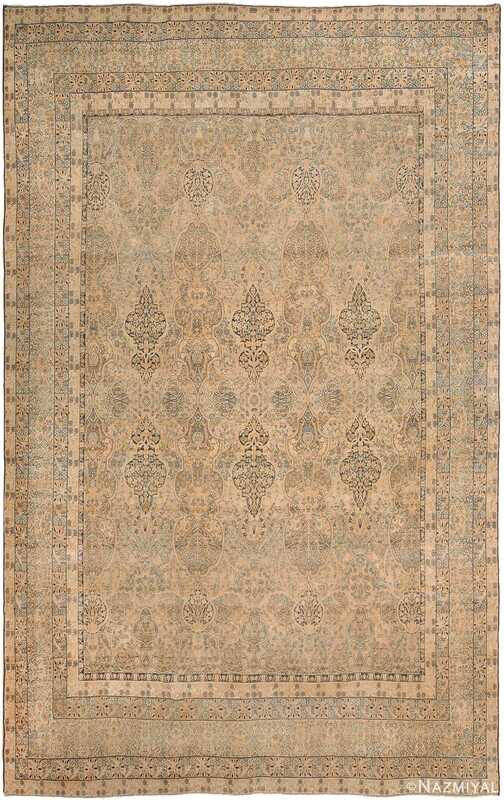 This rug is beautifully executed in a way that brings a simple palette of rug colors together to create a highly detailed design, but yet does not get lost in the details. The weaver had to compensate for the size of the motifs and the rug, which is apparent in a few places in the borders where the design repeats and seems to have an extra motif slipped in. 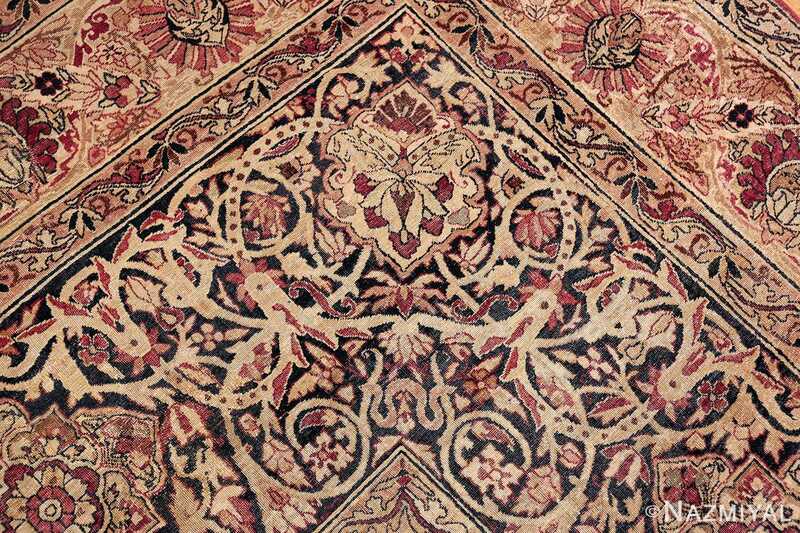 These features add to the charm and refined feel of this elegant piece of textile art. 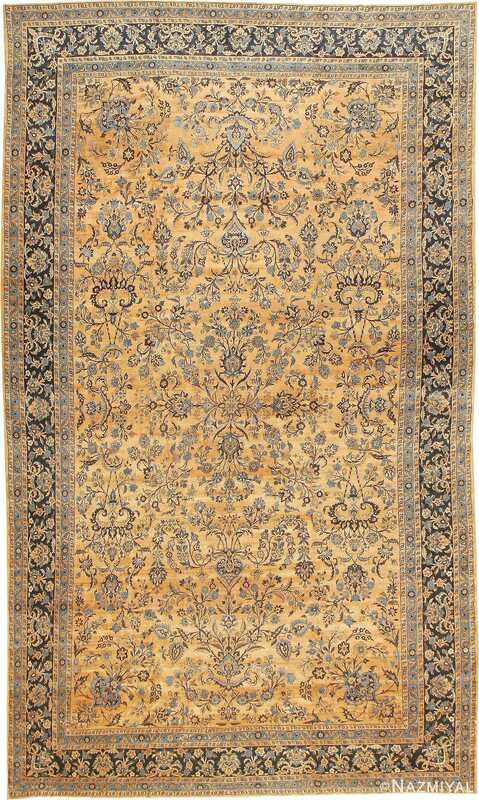 This lovely Oriental antique Large Kerman Persian carpet has an allover spray of soft blue vines and palmettes repeats rhythmically across a golden apricot field.